Home → Hot Topics → Could Your Commercial Mowing and Landscaping Business Use an Extra $1000 per Mower? You’ve seen propane-powered commercial landscape and mowing equipment at the trade shows and wondered if it made sense for your company. Propane fuel has a number of advantages over traditional gasoline-powered equipment, helping your business to run more efficiently. Commercial landscape and mowing companies using propane-powered equipment report no loss of power over traditionally-fueled engines as well as longer engine life and less maintenance required for their equipment. Employees operating the equipment benefit from a healthier work environment due to the lower emissions produced by a cleaner-burning fuel. What’s more, these lower emissions help your business to comply with government standards as well as provisions set forth in many university contracts. Propane allows you to cut the downtime created by refueling, with an easy switch-out of cylinders at the job site, rather than your crew making trips for gasoline. And because propane is an equipment-specific fuel, pilferage of fuel is greatly reduced. 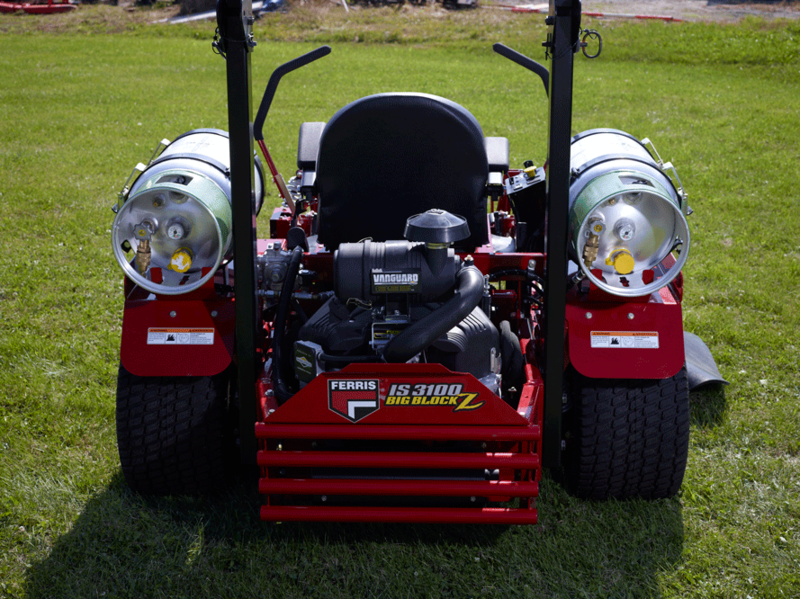 A number of commercial lawn equipment manufacturers offer propane-powered equipment. These companies include: Bad Boy, Bob-Cat, Cub Cadet, Dixie Chopper, Exmark, Ferris, Gravely, Husqvarna, Lehr, Scag, Snapper Pro, and Zipper. In addition, the Propane Research & Education Council is has established the Propane Mower Incentive Program, which provides up to $1000 in incentive dollars for each new qualifying propane-fueled mower purchase, or $500 back for each qualifying mower conversion. There’s no doubt, there has never been a better time to convert to propane for commercial mowing and landscape. The Lin-Gas alternative fuels specialists will make it easy for you to get started with propane. They will help you set up a fuel program that works for your business so you’re ready to roll off to a job rather than roll into a gas station. We make it easy. Call Lin-Gas today at 800-850-4380 or email us at info@lingas.com. Lin-gas has the propane and equipment to get you cutting, so get started before the season arrives.